I thought I would start off my week for a workout recap! I’m trying to be so much better exercising and eating better. October was a killer month for me, but I am doing so much better this month! My weight even went back to normal. Goes to show that exercising really is the best way to go. Not only do you feel better, but you have more energy, sleep better and you lose weight or at least maintain weight! Here was my schedule for last week! Could of done better over the weekend but I was busy and I’ll admit lazy! Total burn calories – 1850, my goal was 1700, so I’m happy with that! In between, I do squats, lunges and march in place. I try to keep moving when taking the dogs out and cooking, even watching tv! Every bit helps!! 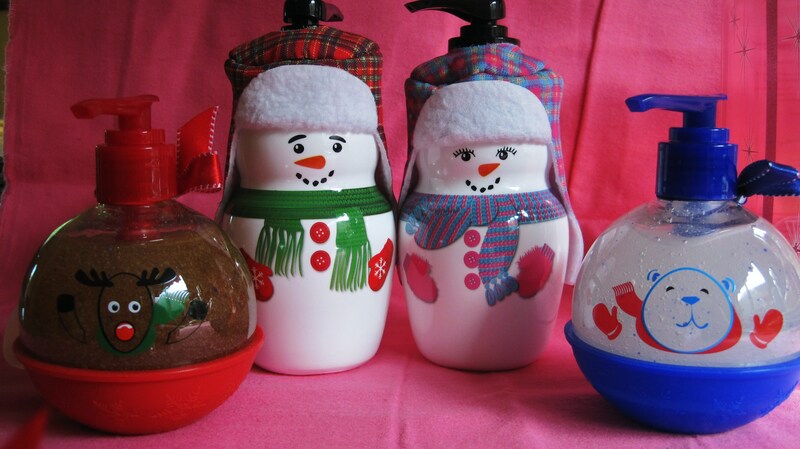 I mentioned I went shopping on Saturday, I wanted to show you some seasonal items I bought from Bath & Body Works. 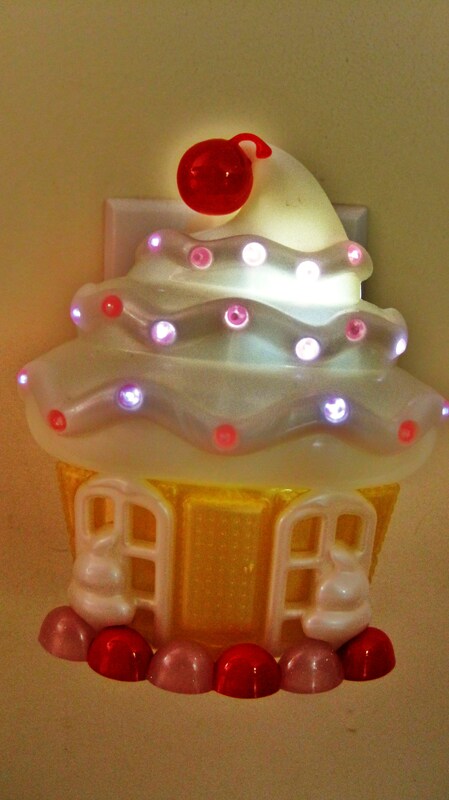 How cute is the little cupcake house? It lights up,I’m actually looking at it right now! It’s so adorable! 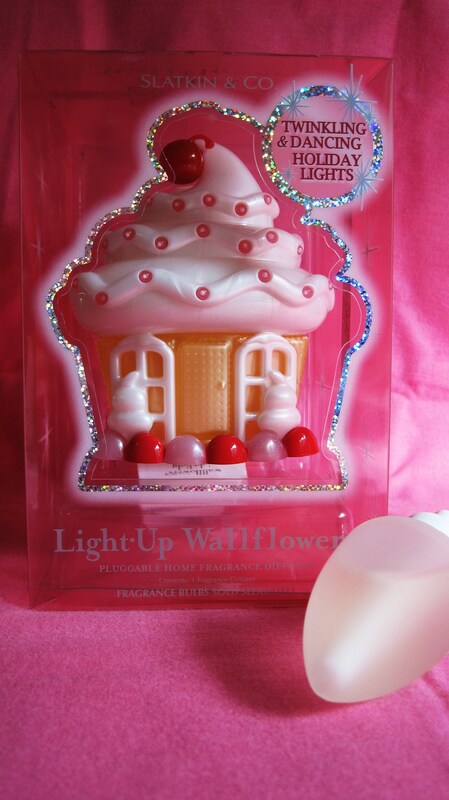 I put the Winter Wallflower scent in it. It has a hint of evergreen in it and I don’t know what else, but it smells good!! It really lights up a dark room!! I also bought these soaps! The boy and girl snow man will go in my bathroom. One at Hubby’s sink and one at mine! The little deer and snowman will go in the kitchen! I’m such a sucker for cute holiday stuff! 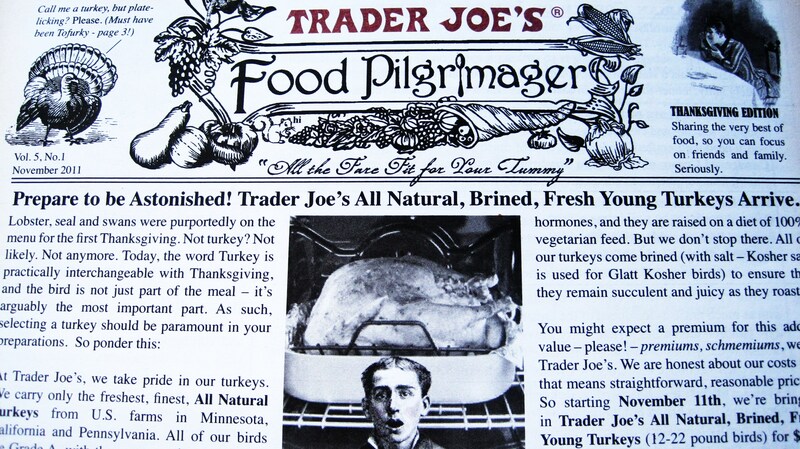 I also went to Trader Joe’s this weekend and got my Thanksgiving Flyer! By the way I updated the Trader Joe’s page, so check it out! I’ll keep adding items! I had a hard time deciding on what recipe to post tonight, since I made a lot of goodies this weekend, but I am going to share with you my favorite! But first let me tell you, I LOVE berries, I’m addicted to them! I was sad and missed them so I had to make this Wild Berry Compote! If you make this now, it will keep you set for the week! Hope mine lasts that long! I normally make this in the summer with fresh berries, but being fall and all, berries just dont’ taste as good, if there even available. I froze a bunch of fruit this summer, so I used my frozen berries. You can also use a bag of mixed berries, thats what I plan on doing next. If you have 10 minutes, you can make this!! See I topped it on my ice cream! I do have to admit, the raspberries had a lot of seeds in them, but that ok! 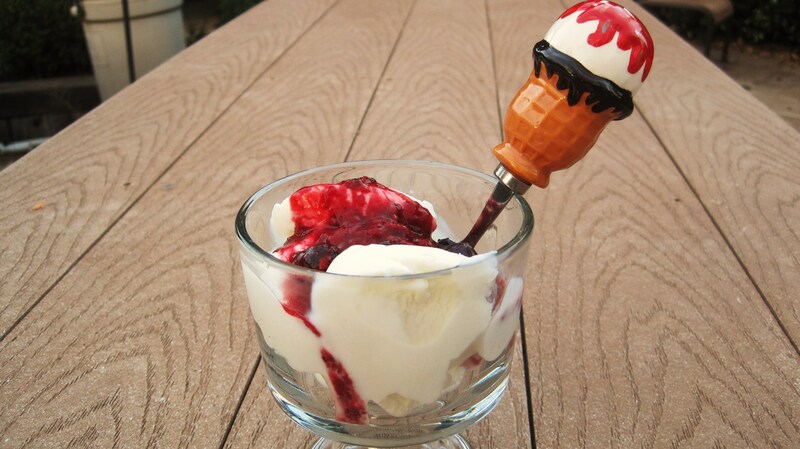 You can use any berries you like! Strawberries are the best, along with blueberries!! You have to try this! 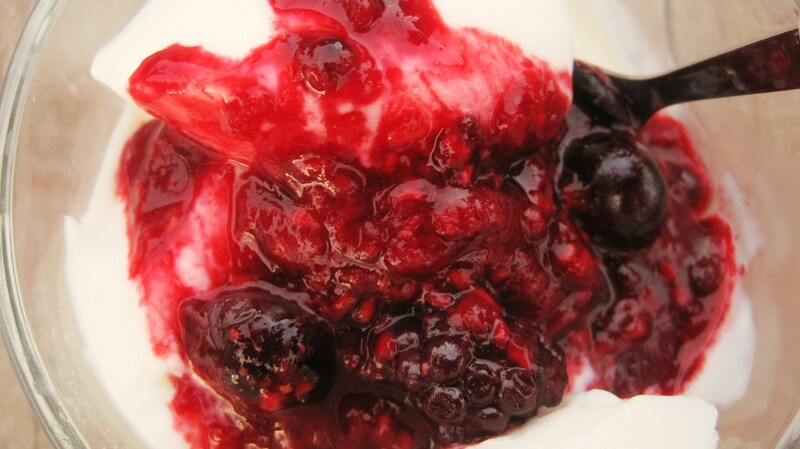 I top this compote on yogurt, frozen yogurt, oatmeal, angel food cake and my Whole Wheat Yogurt pancakes. Check out the pancakes, thats my summer compote on top! 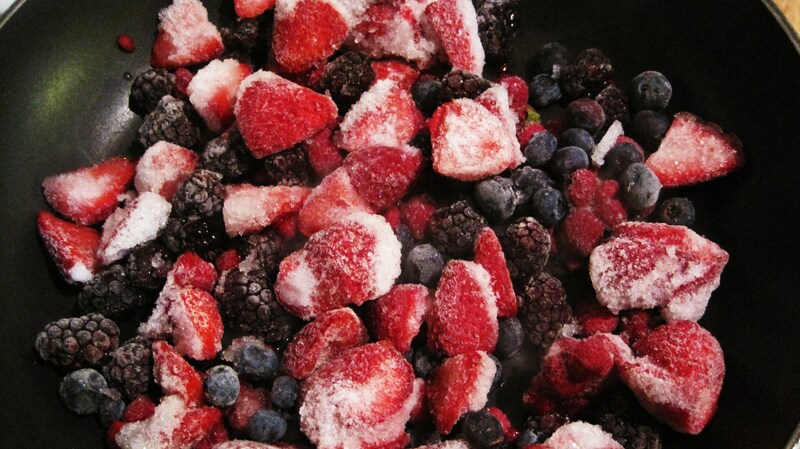 Put 4 cups of frozen berries in a pan and turn the heat up to medium. Cook until thick, about 10 minutes! 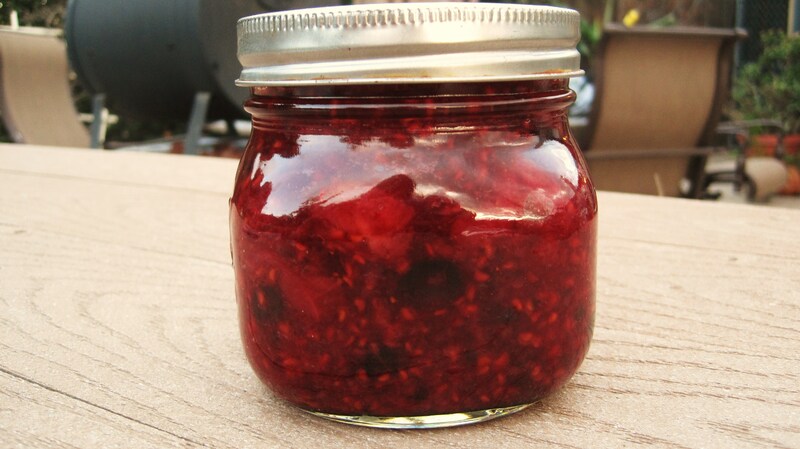 Place in a jar or bowl and refrigerate. Do not can this, there is no sugar in this recipe and your fruit will go bad! 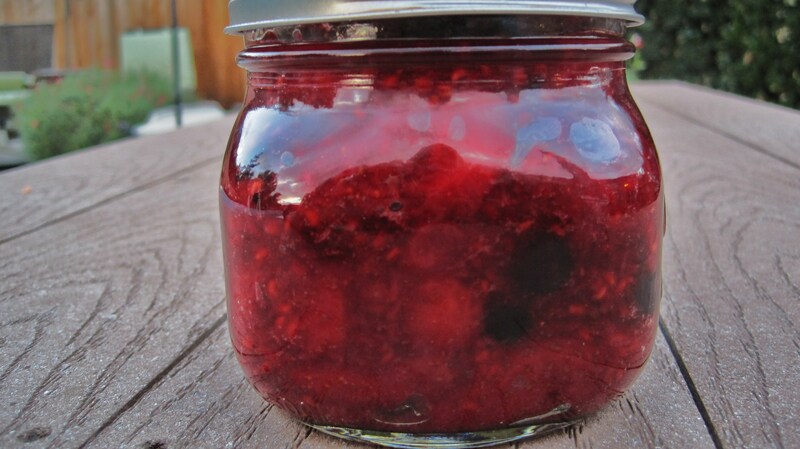 Recipe makes 2 cups of thick, yummy compote! 4 Cups of mixed berries – I used strawberries, black berries, raspberries and blueberries. Use your favorite! Cherries work great too!! 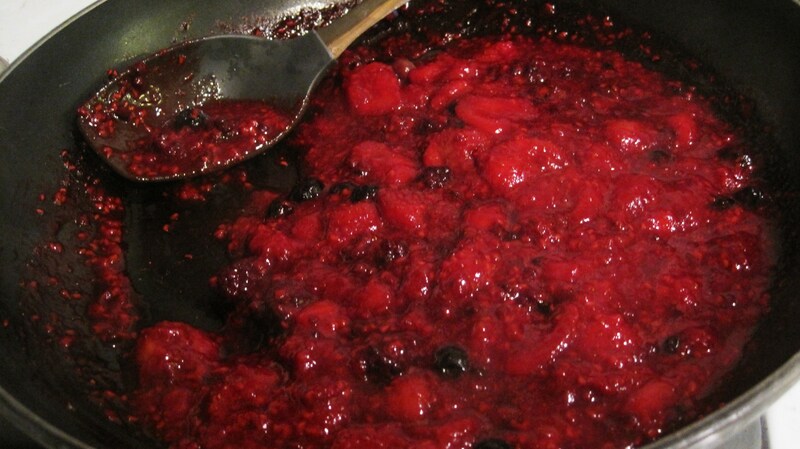 Sugar – Optional, if you like your compote sweetened or your fruit is on the tart side, add about 1/4 cup of sugar. I didn’t add any! Place fruit in a pan, add lemon juice, turn heat up to medium and stir constantly until thick and bubbly. About 7 minutes for fresh fruit and 10 minutes for frozen fruit. Once cool, add to a jar or bowl and refrigerate! This is one of my favorite recipes, I hope you give it a try!! Do you use fruit compote? What kind of fruit do you like? What do you top yours on? I TOTALLY do squats while I’m blow drying my hair. I’m sure I look psycho but I’m the only one who can see. 😛 Congrats on reaching your calorie goal! Can I ask you a random question about kickboxing? I’m thinking of doing a class but I was wondering how much jumping there is? I’m currently not allowed to jump cause of my stress fracture and i just want to know whether i’ll be able to do most of the moves! I would probably stay away from kick boxing for a while. They do a lot of jump roping and jumping jacks to keep the heart rate up and there is quite a bit of bouncing from kicking. The upper body part would be fine. Do you have Comcast On Demand? if you do, go to exercise tv and check out Chris Fryteg 10lbs Slim Down Kickboxing. It really makes you sweat,but there is jumping for sure. You can watch the video and see if you can do it, before joining a class, but personally I wouldn’t recommend it right now. Maybe you could talk to the instructor before joining to see what he or she thinks? I workout to a video, and if there is an exercise I really can’t do, I do something else in place of it. Oh, maybe youtube a kickboxing video to see what you think? Good luck and I hope stress fracture gets better soon!